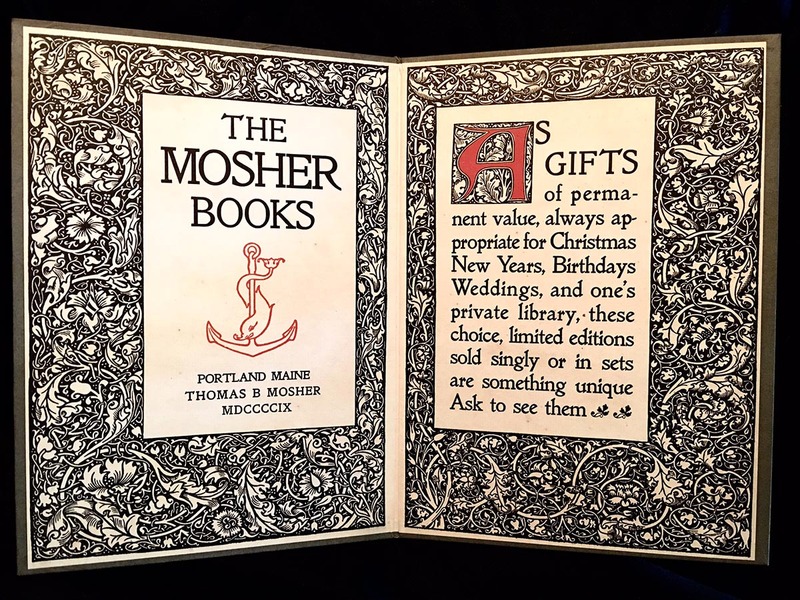 Welcome to the Mosher Press Website which is dedicated to the accomplishments of the American publisher, Thomas Bird Mosher (1852-1923) of Portland, Maine. Mosher’s contributions to the private press movement in the United States rank him high as a major exponent and promoter of the British Pre-Raphaelites, Aesthetes, and Victorians to his fellow Americans. His book styles reflected those of William Pickering and the Whittinghams, the books of the Bodley Head, the Daniel Press, the Eragny Press, and of Charles Ricketts of the Vale Press, just to name a few behind Mosher’s felicitously-designed publications. 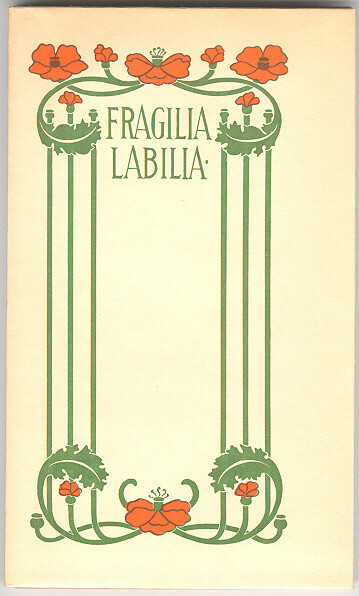 This Mosher Press website is a frequently-updated public service offered through the ABAA bookselling firm, Mosher Books, owned by Philip R. Bishop, who is honored to be a member of the Grolier Club. The site is the result of years of investigation and ongoing discovery into the life of Thomas Bird Mosher and the fascinating outcomes of the Mosher Press. It complements and extends the Mosher Press bio-bibliography: Thomas Bird Mosher: Pirate Prince of Publishers—A Comprehensive Bibliography & Source Guide to The Mosher Books Reflecting England’s National Literature & Design (1998) and Bishop’s own extensive Mosher Press Collection which is made available to serious researchers the world over. 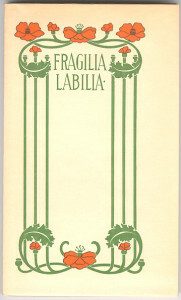 Symonds’ “Fragilia Labilia” with design by Isadore B. Paine. Cover. The website includes recent research into the Mosher Press, as well as selections from books and articles written about Mosher. 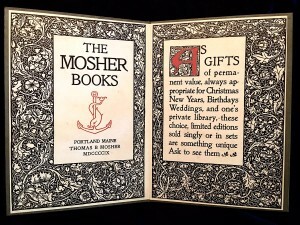 Fully searchable, the website contextualizes Mosher’s place in printing and publishing history, informs on matters related to his famed piracy disputes, organizes information on exhibitions which were either wholly or partly devoted to Mosher, provides visual examples of his books, and overviews choice hand-bound bindings gracing the Mosher books over the past century. Some of Mosher’s own writings are presented, as are the locations and content of significant Mosher Press book and manuscript collections. Bishop’s own essays, articles and books involving Mosher are presented to the reader who wants to further delve into some aspect of Mosher’s life or accomplishments. It is hoped that this website’s presentation is truly a credit to Thomas Bird Mosher’s contributions to the publishing world of the late 19th and early part of the 20th centuries, and a valued source for scholarly research. Comments, questions, and requests are cheerfully received by Mr. Bishop, and are handled on a case-by-case basis. Please give appropriate credit if using any of the site’s content.